At age 72, Johnny Ribkins’ big mistake catches up with him. His mobster boss discovers he’s been robbing him—“wage adjustments,” Johnny called it—and wants his money back . . . in one week. What Melvin doesn’t know is that Johnny and his half-brother Franklin had committed a series of clever robberies before Franklin’s death, and their loot is stashed all over the state of Florida. The Ribkinses are a remarkable family, for they have gifts, superpowers, if you will, but of an unusual and not really feasible kind. Johnny’s father could see in the dark. A cousin could talk to fish. Franklin could scale walls no matter how high or smooth. Johnny draws maps, of any place, whether he’s seen it or not. And he has maps in his head of all the places where the money lies. With two of Melvin’s occasionally sympathetic henchmen following in a yellow Camaro, Johnny sets out on a rambling journey to reclaim his ill-gotten gains and pay off his debt. A surprise awaits him at Franklin’s home. Just as he didn’t learn of his half-brother’s existence until Franklin was in his twenties, now he discovers Franklin has a daughter. When her mother is called away to help a friend, Johnny finds himself babysitting 13-year-old Eloise, a child with talents of her own. 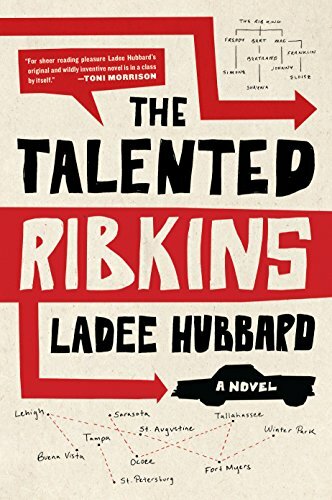 In the following seven days in the life of Johnny Ribkins, Johnny introduces Eloise to her father’s family and tells her their history, of their involvement in the Civil Rights Movement, and of their dubious talents. Though he doesn’t know it, Johnny is on his own journey of self-discovery as he teaches Eloise to embrace her gifts and not be afraid to be different. In reliving key moments in his life as related to his niece, he also realizes family is very important, whether they have “superpowers” or not. This is a most unusual novel about a most unusual family, a family that may look outwardly different but underneath is the same as any other. Johnny’s exploits, told in flashback as he takes Eloise forward into her own future, mark the passage of time and the changing of ideas in his own mind. Johnny’s life is explored from his own perspective as well as his family’s, from a life of excitement and the feeling of accomplish he had as part of the Justice Committee to the desperation of preventing his death at the hands of Melvin’s henchmen. Each bundle of cash he retrieves brings about a new memory and another opportunity gained or lost. Johnny’s interaction with his family, and the revelations of how each now feels about him as opposed to how they felt “back then” sets the pace for what is to come. Toni V. Sweeney is the author of The Adventures of Sinbad and The Kan Ingan Archives series and also writes under the pseudonym Icy Snow Blackstone.